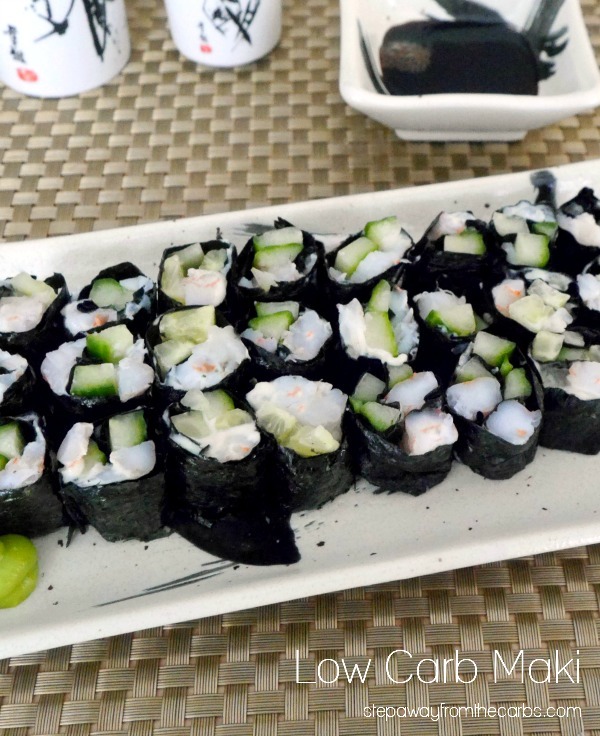 If you love sushi, check out my low carb maki! No rice required. So before I start, I want to make two things clear. 1. I am not a trained sushi chef. 2. 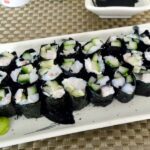 I love sushi so much that this recipe is my way of getting a “fix”. I love sashimi, rolls, maki, nigiri, the whole thing. However, although I’m totally OK with eating raw fish, this recipe actually uses cooked shrimp. Partly cost-related, and partly the availability of sushi-grade fish. Using cooked shrimp makes everything super safe, super simple, and not too pricey! Maki traditionally use rice, of course, but in its place I’m adding extra cucumber, and then adding shrimp and some spicy mayo. You’ll also need some nori sheets, which can be ordered online, although I found mine at Whole Foods. 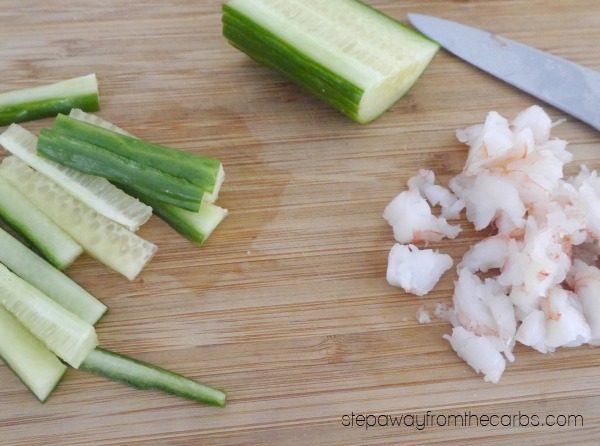 To prepare the fillings, slice up an English cucumber into thin strips. Chop cooked shrimp into small pieces. In a small bowl, mix together mayonnaise and prepared wasabi – taste to check it is as strong as you like it! So here’s where it gets potentially tricky. HOWEVER. I recently received this Sushi Maker as a gift, and it’s very cool. 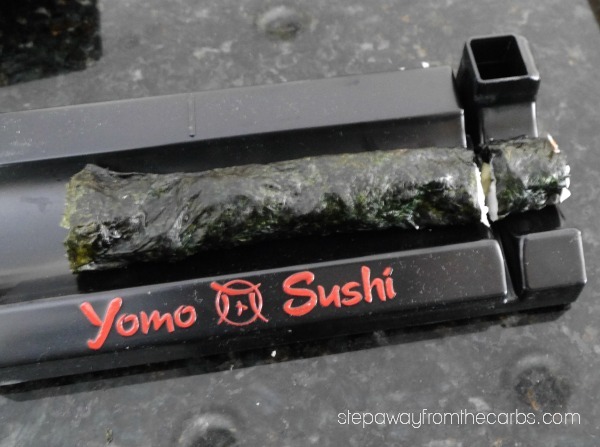 Oh, and perfect for making low carb maki! Obviously the instructions all feature rice, but just ignore that bit and add rows of cucumber, chopped shrimp and the spicy mayo to a sheet of sushi nori. Follow the instructions in the kit – or just roll everything up as tightly as possible. Top tip: If you’re trying this for the first time – don’t rush it! Wait until the weekend, when the kids are at school – whenever it is you can find a quiet moment in the kitchen and ENJOY this culinary art form. The initial results may well not be perfect, but you’ll soon get into the swing of things and produce something that is VERY presentable – and very tasty! Let’s talk carbs for a moment. 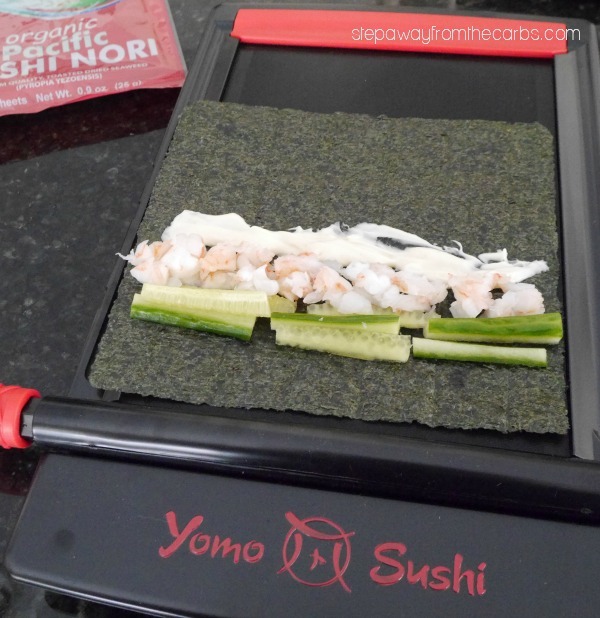 Nori sheets – zero carb. Shrimp – zero carb. Cucumber – pretty much zero. Mayo plus wasabi – pretty much zero. I don’t want to suggest serving sizes because you might like to serve this as a lunch for two, or as part of a party table. Just know that it’s really very low in carbs! The Sushi Maker kit comes with a cutting board – which is VERY useful for turning amateur-rolled maki into rolls that are at least the same height! Serve the maki with extra prepared wasabi, small bowls of soy sauce, and pickled ginger. In a small bowl, mix together mayonnaise and prepared wasabi - taste to check it is as strong as you like it! Add rows of cucumber, chopped shrimp and the spicy mayo to a sheet of sushi nori. Roll everything up as tightly as possible. Slice the roll into even slices. I need a sushi maker! I have only made sushi once, around 100 years ago, when I was still in school and had way too much time. I’ve been sticking to sashimi the last few years when out, but this is such a great idea. 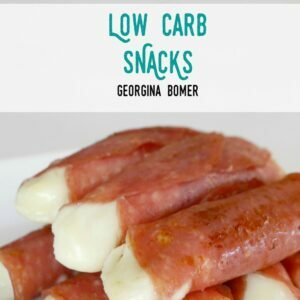 Love your low carb adaptation! It was fun – if a little messy! I have never eaten sushi – but I would eat this with the shrimp! They look perfect! Yes the flavors are so good that even if they are messy then it is still definitely better than missing out completely! That sushi kit looks awesome! I love sushi too so this would be fun to make at home! Do you think it would work well with cauli rice? I made some a year or so ago and used no calorie rice mixed with we cream cheese and then addedcrab and veggies and rolled. Turned out really good.